The 2016 is a blend of 55% Cabernet Sauvignon, 16% Malbec, 15% Merlot, and 14% Petit Verdot. The colour is a bright crimson. Quite charming and subtle, the nose gives the impression of salinity, with aromas of clove, cocoa, blood orange and touches of river silt sitting over dark fruits. The elegant palate mirrors the nose, with ripe reds fruits sitting over an acid backbone, creating a lovely mix of floral elements and fruits. The wine lingers with some lively acidity. This is a very driven wine with lots of latest power – it will be best enjoyed from 2021 to 2026. Enjoy a glass with slow cooked lamb shanks, or spiced red wine braised beef short ribs. ‘Clémentine is a blend of 55% Cabernet Sauvignon, 15% Merlot, 14% Petit Verdot and 16% Malbec. 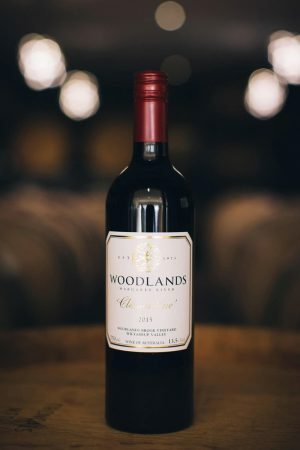 The nose displays a ripe and powerful array of dark berry fruits, five spice, and toasty French oak notes. The pallet mirrors the nose, with a polish and density that marks all fruit from Woodlands Brook.